The Martian Chronicles – Chapters Ten to Fifteen - Jimmie Aaron Kepler, Ed.D. Chapter Ten – The Locusts (February 2002/2033)-This story first appeared in The Martian Chronicles. This vignette concerns the swift colonization of Mars. The title refers to the rockets and settlers which quickly spread across all of Mars. Chapter Eleven – Night Meeting (August 2002/2033)- This story first appeared in The Martian Chronicles.This story begins with a conversation between an old man and a young traveler, Tomás Gomez. The older man explains that he came to Mars because he appreciates the new and novel. Even everyday things have become amazing to him once again. He has returned full circle to his childhood. Later, Tomás encounters a Martian named Muhe Ca. Each can see the Mars he is accustomed to, in his own time frame, but the other person is transparent to him and has the appearance of a phantom. The young man sees ruins where the Martian sees a thriving city, while the Martian sees an ocean where Tomás sees the new Earth settlement. Neither knows if he precedes the other in time, but Bradbury makes the point that any one civilization is ultimately fleeting. This is the only full-length story in The Martian Chronicles which had not previously appeared in another publication. Chapter Twelve – The Fire Balloons (November 2002/2033)- This story first appeared as “…In This Sign” in Imagination, April 1951. A missionary expedition of Episcopal priests from the United States anticipates sins unknown to them on Mars. Instead, they meet ethereal creatures glowing as blue flames in crystal spheres, who have left behind the material world, and thus have escaped sin. 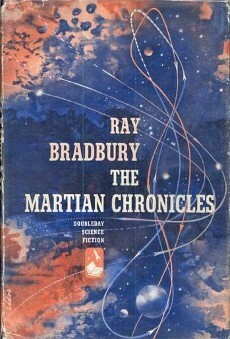 This story appeared only in The Silver Locusts, the British edition of The Martian Chronicles, the 1974 edition from The Heritage Press, the September 1979 illustrated trade edition from Bantam Books, the “40th Anniversary Edition” from Doubleday Dell Publishing Group and in the 2001 Book-of-the-Month Club edition. It otherwise appeared in The Illustrated Man. Chapter Thirteen – The Shore (October 2002/2033) – This story describes the rippling outward of colonization, the This story first wave being loner, pioneer types, and the second, also Americans, being from the “cabbage tenements and subways” of New York. Chapter Fourteen – Interim (February 2003/2034) – This story first appeared in Weird Tales, July 1947. This story describes the building of a Martian town by colonists and how much it was made to resemble an average Midwestern American town. The town was said to have appeared to have been swept up by a tornado on Earth, and brought to Mars. Chapter Fifteen – The Musicians (April 2003/2034)- This story first appeared in The Martian Chronicles. Several boys venture into the ruins of the Martian cities. They go into the houses and play with the debris, imagining that they are on earth, playing with the autumn leaves. Added onto their fun is their chance to play on the “white xylophones”—the ribcages of the Martians. They have a sense of urgency because soon the firemen will take all of their fun away. The firemen are the men who go and clean up the remains of Martians in the ruined cities.